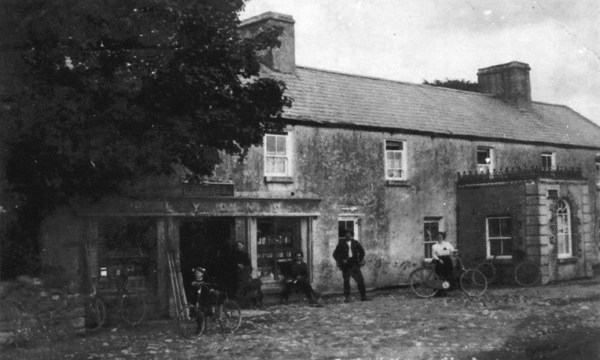 The Inn of Glentane is located at the crossroads of ancient and modern territories in east Co Galway, ‘Ruane’s Inn of Glentane’ in Ballymacward parish (pictured above c.1913) has been a natural stopping-point for centuries. Aside from hosting travellers and their coachmen, the Inn of Glentane was also a rest stop and mail coach stop from at least the early seventeenth century. It was in the eighteenth century however, that the Inn would find itself at the centre of Galway history. The biography of Theobald Wolfe Tone noted that Sir Thomas French and various local gentlemen held a significant United Irishman meeting at Glentane on the 20th October 1792. This clandestine meeting was apparently one of the most important in the entire province. Then, in 1798, the United Irishmen finally ‘rose’ and fought ultimately fruitlessly for liberty. That October a strong ‘party of corps’ of the British army marched from Loughrea to Menlough, and then to Castleblakeney in chase of rebels. They were however ‘strongly discouraged’ from going there by the local magistrate and yeoman, Captain Caesar French, of the same French family! Following the exchange of letters, which the British army Captain Newenham described as ‘strange’, the two captains eventually met at Glentane. Newenham did not disclose the detail of the meeting; however he left the Inn furious. When Newenham surrounded Castleblakeney in order to capture rebels, French’s son-in-law, Lieutenant Burke-Eyre, interceded and dismissed his men who had been supposed to assist Newenham. It soon became clear that within French’s corps were a number of rebels and deserters from other militia. The French family would pay a heavy price for their actions as a court of enquiry found against them. They would lose their house at Fairhill near Glentane and many of the men to whom they had given refuge were captured. This page was added on 06/09/2014.